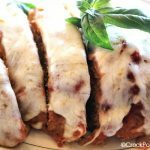 My family adores meatloaf, all kinds of meatloaf and I love making my meatloaf in the slow cooker because it is fuss free and it always comes out nice and moist. Moisture is important when you are working with meats like ground chicken (or turkey) because it tends to dry out. But not with this recipe. And that is why I decided to go the slow cooker route with this easy recipe that is also rather healthy compared to traditional meatloaf. I love chicken Parmesan. Fried cutlets of breaded chicken, smothered in a delicious Italian marinara sauce and mozzarella cheese. I tried to replicate that taste and those ingredients in a ground chicken meatloaf form. It has all the yummy flavors without the frying! And of course it tastes like a meatloaf too. If you are pressed for time you can easily make the meatloaf mixture ahead of time a day or two in advanced and keep it in the refrigerator. I tend to whip up the meat mixture for most meatloaf’s the night before, toss it in a big gallon sized plastic bag and throw it in the fridge. 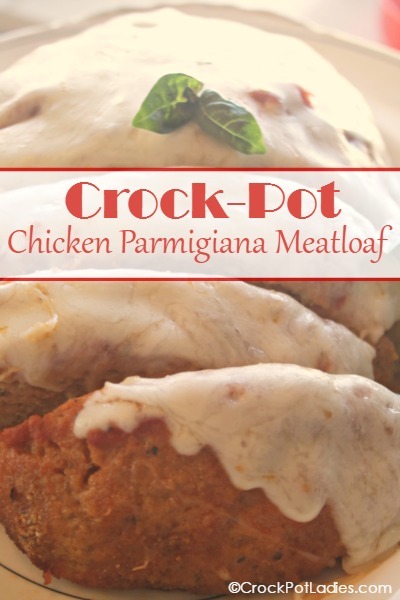 The next day I just plop the meatloaf mixture out of the bag and into a crock-pot (I used my 3.5 quart casserole crock-pot in this recipe), shape it into a loaf, dump the other 1/2 cup of marinara sauce over the top and spread it around a little with a spoon or spatula, turn the slow cooker on to cook and call it day. At the end of cooking sprinkle on some fat free mozzarella cheese and let it melt all nice and gooey. And then serve it up. I paired our meatloaf with a nice side Caesar salad and it was a hit with the entire family. In a bowl mix together with your hands the ground chicken, bread crumbs, Parmesan cheese, egg, 1/2 cup marinara sauce and Italian seasoning until well combined. Place meat mixture in the bottom of either a casserole crock-pot or a 5 quart or larger oval crock pot and shape into a loaf shape. Pour the remaining 1/2 cup of marinara sauce over the top. Cover and cook for 4 – 6 hours on LOW or 2 – 3 hours on HIGH. During last 10 minutes of cooking sprinkle mozzarella cheese over top and cover again to let cheese melt. Serve with a nice Caesar salad and some crusty bread for an easy meal and enjoy! I just made this on a snowy winter day in January. Comfort food at it’s finest. 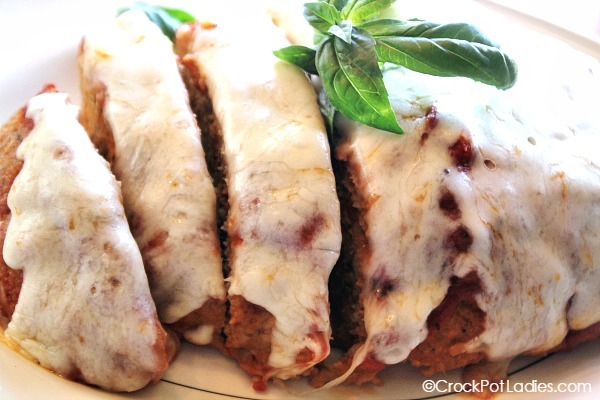 Juicy and flavorful meatloaf which is usually hard to do without lots of mushrooms in the meat. This one doesn’t need a thing. Double the recipe it’ll be gone in no time. Aww thanks Rayne! I am so glad you enjoyed this recipe. It really DOES come out juicy and flavorful!